Yesterday was our Wedding Anniversary so of course I made my Husband a card. Where did the Navy stripped paper come from? The stripes are from the Springtime Foils Designer Series Paper (DSP) that you can get for free when you spend $110 (only until the end of March). 'But that paper is white' I hear you say. Yes it is white, and that's the beauty of this DPS. You can colour sections of it - Stampin' Blends are good for that - or you can colour the whole piece like I did here. 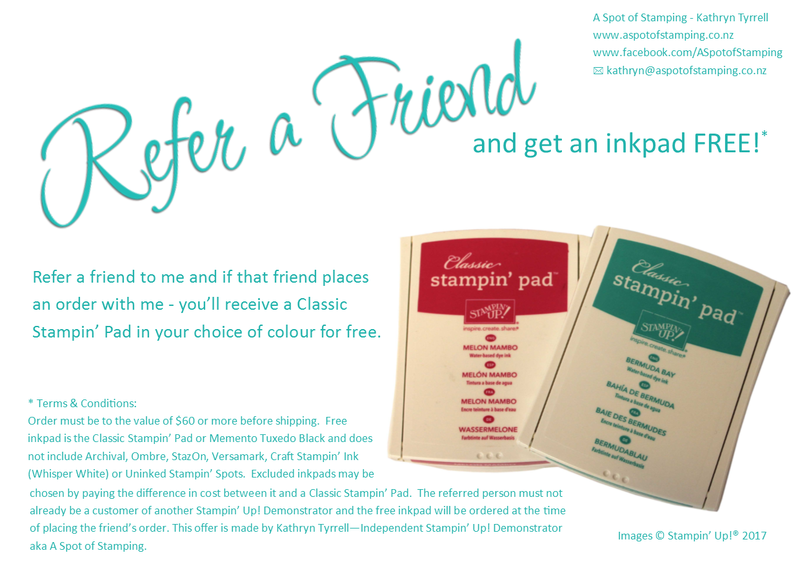 I used an inkpad to colour mine but there are various ways you can choose to do it. Or just leave it white. Its beautiful as it is if you don't want to colour it but I wanted a more masculine look. Inside I used a sentiment from Blooms and Wishes and the little hearts, both on the inside and the front, came from Sharing Sweet Thoughts (which by the way is the current Ronald McDonald stamp set - a brilliant cause to buy that one). The sentiment on the front comes from Fabulous Flamingo. How did I get a single animal? The idea for the two critters holding hands comes from Connie Richter. 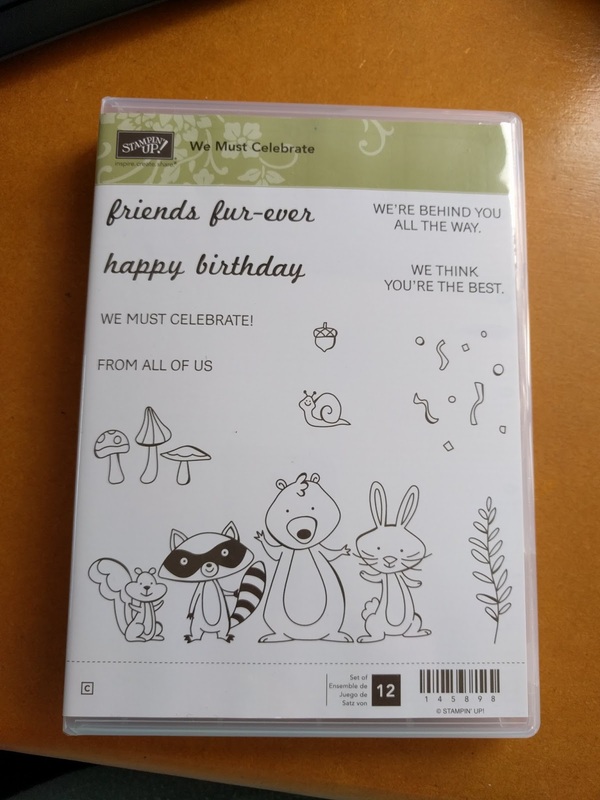 The stamp is actually four different critters and only one of each animal, so there was a bit of technique to get a single animal, and two of them at that. 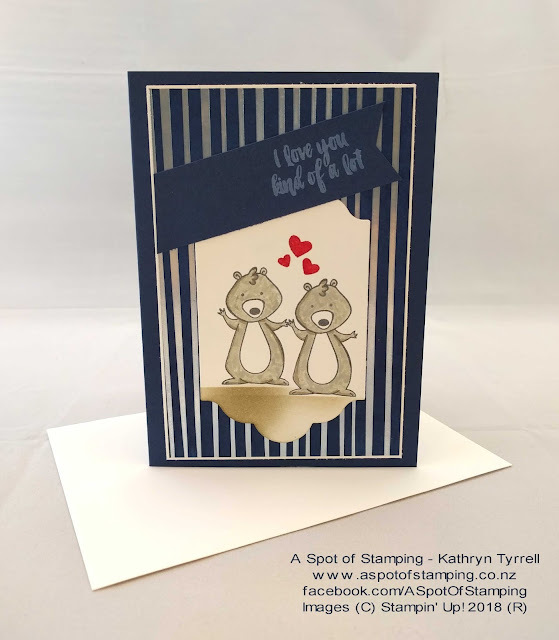 To get a single animal I used my Stampin' Write Basic Gray Marker and I coloured directly onto the stamp, only inking the animal I wanted. 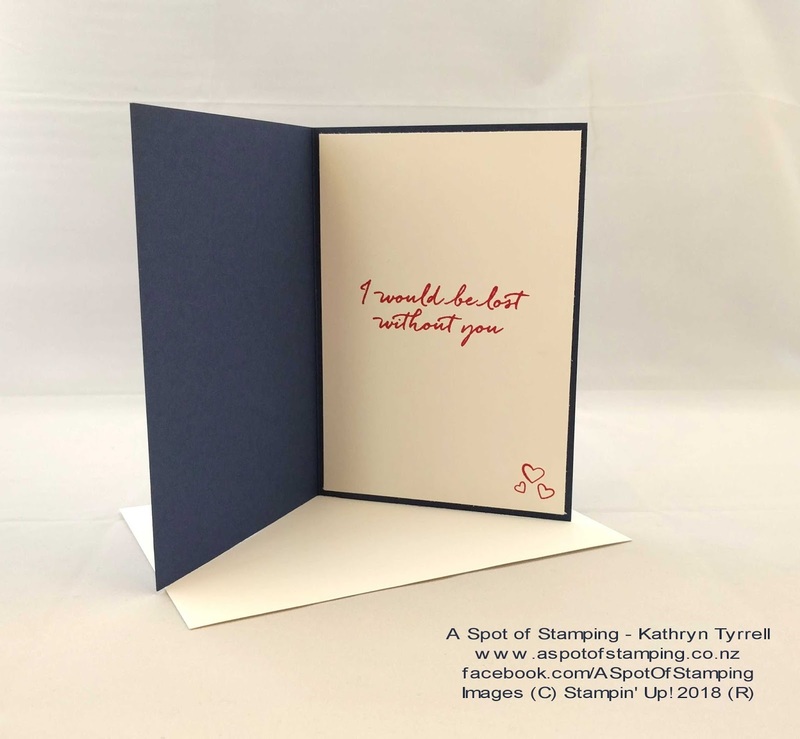 Then I stamped that onto a piece of Whisper White cardstock. Next I got out my Stamp-a-ma-jig and lined up exactly where I wanted the second bear (are they bears? I'm not sure what they are). 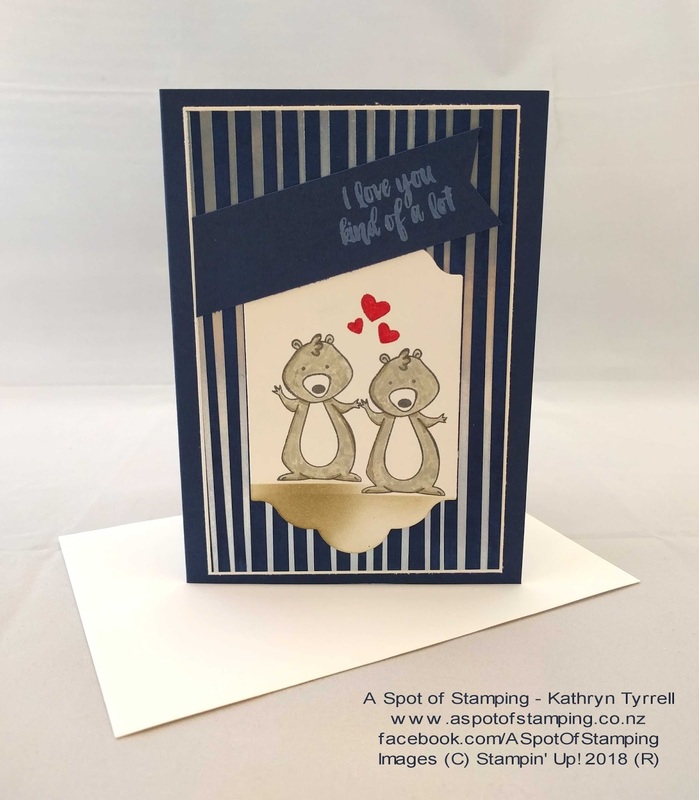 Yes, I have a Stamparatus but I wanted the animals to be holding hands and I couldn't be sure of the exact placement of the hands with the Stamparatus, as the stamp is red rubber not photopolymer. Once I was happy with where I wanted the second animal to be I stamped and held my breath. When I had my two bears I set about colouring them in. I did have a few troubles with my animals. 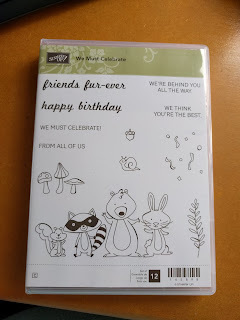 I found that although my stamp looked clean, when I stamped it down after inking just the bear (or whatever he is) I still had a shadow image of the rabbit and the raccoon. I had to go back and give my stamp a really good clean and even then I think my Stampin' Scrub itself needs a clean so that didn't work. I ended up cutting a mask and masking off the other three animals but I still used markers to ink my image.